St Paul I, a native of Thessalonica, was elected the sixth Bishop of Constantinople in 337. Previously, he had been a presbyter of Constantinople and secretary to Bishop Alexander of Constantinople, his predecessor. St Paul was exiled on three occasions for his teachings while the city of Constantinople suffering greatly. On his third exile, he was taken to Cappadocia and imprisoned without food. After six days and much to the disappointment of his captors, he remained alive so, they strangled him claiming that he had died following a short illness. 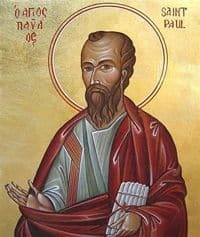 St Paul’s Feast Day is the 7th June. Pray for us that we will live by and uphold the teachings of the Catholic faith throughout our days.